The Last Tycoon is F Scott Fitzgerald's final novel. It is largely unfinished, but the edition I read includes his notes detailing his plans for the rest of the story. 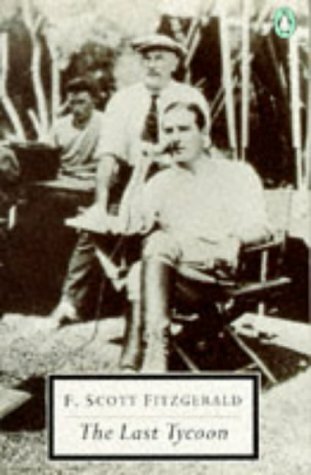 This book is based on Fitzgerald's experiences in Hollywood and it centers around Monroe Stahr, one of the last moguls in the golden age of movies. Stahr's whole life revolves around the studio until he happens to see a woman who reminds him of the love he lost. Similarly to Tender Is The Night, this novel is narrated by a young woman with a fascination with our protagonist. Cecilia Brady is the daughter of another powerful producer who attempts to explain why Stahr was one of the last great producers in Hollywood. This device seems strange to some readers, but I found it a wise choice. Stahr needs to maintain some mystery and Fitzgerald achieves this by distancing him from the readers a bit. Cecilia knows and admires Stahr and we see a different version of him through her eyes than we would if he narrated his own tale. Fitzgerald gives us an insider's look at the inner working of the Hollywood studios of the past through both Cecilia's eyes and Monroe's. We see Stahr interact with all sorts of film people from extras to camera people to directors. While many movies depict the glamour of old Hollywood, this novel shows the loneliness of truly being invested in making art. Stahr gives everything he has to the movies, working all hours and often sleeping on the couch in his office. Through this story, Fitzgerald asks a question that plagues authors, musicians, and artists: Is it possible to commit to both your art and to another person? It's fascinating to read Fitzgerald's notes and look at the direction he planned to take this story and his characters. I wonder what he would have changed, had he lived to complete the novel. The chapters we do have contain intriguing characters and a flow and cohesion in his writing that is sometimes lacking in his other works. The Last Tycoon gives readers a wonderful and terrible taste of what might have been if Fitzgerald had not died so tragically young. In the middle chapters, it has the same magic as The Great Gatsby. Reading this book will remind you of Fitzgerald's genius and make you mourn the novels he might have written. For the last selection in my "reading F Scott in a year" adventure, I think I'm going to pick up a biography. Any suggestions? I haven't read nearly enough Fitzgerald and that makes me a bit sad. One day! You'll get there...it's tough to commit to reading all of one author's work when there are so many great authors to read! As much as I like Fitzgerald, I always have an irrationally difficult time with unfinished work. I have a collection of letters between Fitzgerald and Sheilah Graham that I've been meaning to get to for years. Should be interesting reading, methinks. It mostly made me feel sad. There was just enough book to start investing in the characters and then it was over. I will have to look into that letter collection. It's so interesting to see how someone portrayed themselves to their closest friends. Thanks for the idea! Great review, Lindsey! I am so ashamed to admit that I've only read The Great Gatsby. I've added The Beautiful and Damned (the fancy penguin edition) to my Christmas list. I actually have this one, which was passed down from my Grandfather, but actually had no idea what it was about. Reading about Fitzgerald, his work takes on a more tragic light as it seems his life was filled with heartache (and possibly lots of bad decisions). It's interesting, too, because many titles by authors can be perceived as an extension of one's own life, but his seems to mirror his to a shocking degree. I'm looking forward to giving this a go and discussing it in more detail. Glad you enjoyed it! P.S. My friend is hosting a 20s themed NYE party and my boyfriend and I have been using images of Fitzgerald to get his outfit all squared away. So dapper! P.S. - My hubby and I dressed up as F Scott and Zelda for a party once. It's so much fun! I'm one of those ridiculous readers who LOVED Gatsby but hasn't read a single other Fitzgeral novel. I know! I know! I have tried and tried to read Tender is the Night and always flake out before I finish. I'm totally taken with the idea of this one because it is unfinished. Great review, Lindsey! Thanks, Andi. Some of his other books are sort of choppy because he likes to jump in time and genre. The Last Tycoon reminds me of Gatsby though, because it has a similar tone and the words and story flow just as well. You might like this one!